A perennial Judicial Hellhole, California has once again regained its position atop the Judicial Hellholes list after a two-year hiatus. California judges and legislators alike have a propensity to expand liability at almost every given opportunity. The predatory litigation, driven by the powerful plaintiffs’ bar, is an assault on the California consumer. The cost of living in California continues to be among the highest in the country due in large part to housing, food and energy prices, all of which have been driven up by lawsuit abuse and excessive state regulations. A recent Perryman Group study estimates that excessive tort costs to the California economy result in $11.6 billion in annual direct costs and 197,776 lost jobs when dynamic effects are considered. searching for new theories of liability. Some have struck it rich. into developing a medication to liability when a person who took a generic version made by a competitor alleges an injury from the drug. California’s decision to adopt innovator liability makes it an outlier. At least 35 state and federal courts have rejected innovator liability, which is a disincentive for companies to develop medications that save and improve lives. After the Alabama Supreme Court adopted this deep-pocket approach in 2014, the state’s legislature quickly overturned the ruling. a brand-name drug manufacturer, Novartis, brought by a person who took a generic version of a drug. The California Supreme Court, however, ruled that the case could move forward even when Novartis had sold its rights to the brand-name version six years prior to the plaintiff ‘s alleged injury. The California Supreme Court took this approach even as it recognized that “only a handful of courts” had adopted innovator liability. If innovator liability flourishes, it could impose billions of dollars of unwarranted liability on companies that invest significant time and expense to develop new products that are later copied and sold by others. These companies will be forced to act as an insurer for their generic competitors’ products, which is likely to divert significant resources from research and development. Since 90% of the current prescription drug market is generic, innovator liability has the potential to shift 100% of the liability to the 10% of the market that we rely upon to develop new medications. Baseless Proposition 65 litigation unjustly burdens companies that do business in California. The money spent by companies on compliance and litigation unnecessarily drives up the cost of goods for California consumers. It also subjects consumers to Henny Penny-like warnings declaring that everything from brass knobs to Disneyland causes cancer. The originally well-intentioned law, enacted in 1986, is now one of the plaintiffs’ bar’s favorite tools to exploit. Under Prop-65, businesses are required to place ominous warning signs on products where tests reveal the slightest, non-threatening trace of any of more than 900 listed chemicals that state environmental regulators deem carcinogenic or otherwise toxic. A troublesome part of the law allows private citizens, advocacy groups and attorneys to sue on behalf of the state and collect a portion of the civil fees, creating an incentive for the plaintiffs’ bar to create these types of lawsuits. 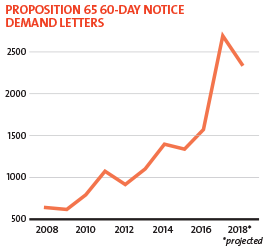 Each year, they send thousands of notices to companies threatening Prop 65 litigation and demanding a settlement. A search of notices on the California Attorney General’s website shows that the number of these threatened lawsuits has tripled over the past decade. Food and beverage companies are among the prime targets. According to the California Attorney General’s website, businesses settled 688 Prop 65 actions in 2017 totaling $25,767,500. Three-quarters of this money, $19,486,362, went to the attorneys who brought the lawsuits to cover their fees and costs. Just 24 advocacy groups, law firms, and individuals were behind this litigation. In 2018, the California Office of Environmental Health Hazard Assessment (OEHHA), the chemical watchdog group responsible for enforcing Prop 65, issued a new set of regulations. It now requires a business owner to list all major chemicals present in a product, as opposed to having a general warning. Under the new rules, individual product signage is required on every store shelf. Failure to properly display a $40 sign could result in fines and legal settlements as large as $60,000-$80,000. California courts and legislators have provided a mixed bag when it comes to their handling of Prop 65 litigation in 2018. On the one hand, a federal judge in the District Court for the Eastern District of California halted a Prop 65 requirement that Monsanto place warning labels on its Roundup® products, ruling that there was “insufficient evidence” the popular weed killer causes cancer. The Prop 65 requirement was based on a 2015 conclusion by the International Agency for Research on Cancer (IARC) that glyphosate was a “probable” carcinogen. As discussed later in the Closer Look section on junk science, the IARC is a specialized cancer agency of the World Health Organization known to be outmoded, heavily politicized, and sub-standard in the quality of its science. $39.25 million, in order to adhere to due process limits. ATRA will continue to keep a close eye on this case. Please check www.judicialhellholes.org for updates. Another significant problem with Prop 65 litigation is that companies’ products are considered harmful until proven not to be. After subjecting companies to nearly a decade of litigation, Los Angeles Superior Court Judge Elihu Berle ruled in March that companies that sell coffee, like Starbucks, failed to show that coffee does not cause cancer; therefore, they must place cancer warnings on lattes and post warnings in their stores. After the California agency that oversees Prop 65 warnings proposed exempting coffee from cancer warnings in August, plaintiffs’ lawyers—you guessed it—sued the State of California too. Enacted in 2004, California’s Private Attorneys General Act (PAGA) has become a means around arbitration clauses in employment contracts that limit costly, plaintiffs’ lawyer-enriching class actions. PAGA authorizes “aggrieved” employees to file lawsuits seeking civil penalties on behalf of themselves, other employees and the State of California for labor code violations. Many PAGA lawsuits revolve around technical nitpicks, such as an employer’s failure to print its address on employees’ pay stubs, even though the address was printed on the paychecks themselves. Seventy-five percent of the penalties paid by non-compliant employers go to the state’s Labor and Workforce Development Agency while only twenty-five percent goes to the “aggrieved employees” and their lawyers who take a third or so of that. In some cases, the plaintiffs’ lawyers receive even more. For example, plaintiffs’ lawyers walked away with forty percent of a recent $9 million PAGA settlement with Target. That settlement resolved three lawsuits accusing Target of failing to provide seating for more than 90,000 cashiers during their shifts. Target argued the nature of the cashier position does not permit sitting down, but settled given the lengthy litigation and plaintiffs’ seeking more than $200 million. A California judge approved a settlement that awarded the lawyers $3.9 million in fees and $200,000 in costs, even as he expressed discomfort with the amount that would go directly into the pockets of the attorneys. “Just don’t tell anyone,” he quipped at a July 2018 hearing. This year, two state appellate courts further expanded PAGA liability by allowing individuals to bring “no- injury” PAGA lawsuits. First, the Court of Appeals for the Third District ruled in May 2018 that, in PAGA lawsuits, “[a]n act may be wrongful and subject to civil penalties even if it does not result in injury.” The following day, the Sixth District found that a person affected by one Labor Code violation can sue an employer for any potential Labor Code violation, even if it did not affect him. The U.S. District Court for the Northern District of California also weighed in on PAGA this year in a massive labor law class action against Walmart. There, the court allowed a PAGA suit that alleged pay stubs were not compliant with PAGA because they lacked pay period start and end dates to proceed and that Walmart could not cure the omission by issuing a compliant wage statement. In October 2018, Walmart also agreed to settle another cashiers’ seating case for $65 million, the largest settlement in the history of PAGA. Unfortunately, three PAGA ballot initiatives were removed from consideration by their proponents in January of this year. The initiatives would have gone a long way toward eradicating the abuses taking place under PAGA. The first initiative would have repealed PAGA and placed an executive official in charge of issuing civil penalties for labor violations. The other two would have prohibited attorneys from collecting contingency fees in PAGA lawsuits, required an employee who brings a PAGA claim to personally suffer an actual injury, and mandated ethics training for lawyers filing PAGA claims. California courts, both state and federal, continue to be ground-zero for “no-injury” consumer protection lawsuits targeting the food and beverage industry. The number of lawsuits has risen sharply in recent years. Since 2012, plaintiffs’ lawyers have filed over 500 class actions challenging the marketing or labeling of food nationwide. About one third of the food class action litigation in federal courts nationwide is in the Northern District of California, also known as the “Food Court,” located in San Francisco. 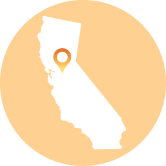 California is a favorite for these lawsuits due to its plaintiff-friendly Unfair Competition Law (UCL) and the potential to bring large class actions. Many of the targeted companies settle the litigation instead of risking the high cost of a trial and the negative publicity that would follow, leading to multi-million dollar settlements that feed the plaintiffs’ bar and provide little to no benefit for consumers. For example, this year, Ferrara Candy Co. settled a class action lawsuit in the Northern District of California for $2.5 million. While Ferrara had accurately labeled its boxes with the number of ounces of candy inside, the lawsuit alleged that, due to the size of the boxes, consumers would think they would get more Jujyfruits or other candies. Consumers are entitled to a cash refund of $0.50 cents per purchase, up to $7.50 if no receipt is provided. The plaintiffs’ attorneys, who say they spent 1,500 hours and $365,000 in expenses to protect the right of consumers to get their due share of candy, asked the court for $750,000 in attorneys’ fees, $520,000 to administer the claims process, and a $5,000 incentive award for the class representative. By allowing these “no-injury” lawsuits to prosper, California judges have opened companies up to exploitation by entrepreneurial plaintiffs’ lawyers. Recently, YummyEarth received a letter from an unscrupulous plaintiffs’ lawyer demanding $25,000 or else the company would be sued for intentionally misleading consumers by labeling lollipops as having “evaporated cane juice” instead of sugar. Apparently, his client was surprised to learn that there is indeed sugar in lollipops. After YummyEarth refused to submit to the lawyer’s demands, the plaintiff purchased the lollipop, and subsequently, filed a lawsuit in the San Bernardino Superior Court. The lawyer representing the plaintiff, Ryan Ferrell of Apex Trial Law, is currently involved in a racketeering lawsuit that accuses him and his previous firm, Newport Trial Group, of hiring college students to serve as plaintiffs in class action lawsuits. The case was filed in 2015 and is still working its way through federal court. The Northern District Court of California did provide a bit of encouraging news this January when it dismissed a proposed class action lawsuit alleging Starbucks under-filled its lattes and mochas to purportedly save on the cost of milk by topping the drinks with milk foam. As Judge Yvonne Gonzalez Rogers recognized, “no reasonable consumer would be deceived into believing that Lattes which are made up of espresso, steamed milk, and milk foam contain the [number of ounces advertised on the menu] excluding milk foam.” Two months later, the U.S. Court of Appeals for the Ninth Circuit dealt another blow to frivolous California food litigation when it affirmed a trial court ruling that similarly found consumers understand that their iced coffee will include, yes, ice. Despite such sound rulings, California remains the national epicenter for food class action lawsuits. In February, the California Supreme Court allowed a landmark lead paint ruling to stand by refusing to review the decision. In the lower court case, a California trial court held that Sherwin-Williams and other former lead paint manufacturers companies created a public nuisance in homes built before 1981 in 10 California cities and counties by lawfully by promoting the use of lead-based paint in homes built in the early part of the last century. The companies were ordered to pay $1.15 billion to inspect and abate the affected homes. An appellate court limited the companies’ liability to homes built before 1951 but left undisturbed the finding that lead paint is a public nuisance. The $1.15 billion judgment was reduced to $409 million. keep lead paint settled rather than remove it despite federal, state and local laws that permit intact lead paint in homes. All houses built prior to 1981 are presumed to have lead-based paint, and therefore, are considered a public nuisance, yet abatement funds are only available for homes built before 1951. While the decision only applies to the 10 municipalities named in the case, it has placed the legal status of all pre-1981 California homes in question. The companies urged the U.S. Supreme Court to review the California Supreme Court’s novel ruling on the basis that it violated the free speech and due process clauses of the U.S. Constitution, but the high court denied the petition of certiorari in October. Unfortunately, lead paint claims are not the only “public nuisance” lawsuits burdening California courts. Municipalities have used the lead paint ruling to make similar claims against the oil and gas industries for creating a public nuisance—climate change—by producing fossil fuels. For example, the City of Imperial Beach filed a complaint asserting that energy companies have “caused an enormous, foreseeable, and avoidable increase in global greenhouse gas pollution and a concordant increase in the concentration of greenhouse gases.” The city also claims that the companies have contributed to global warming through their CO2 emissions. A concerning trend has developed in California trial courts for car manufacturers. Lemon law cases are being boot strapped into fraud claims, exponentially increasing damage awards and delaying resolution for consumers. What should be straightforward cases are becoming quite complex and consuming a large amount of the courts’ time and resources. The Song-Beverly Consumer Warranty Act, otherwise known as the California Lemon Law, clearly defines the obligations of consumer goods manufacturers. Under the law, a manufacturer guarantees that a product is in order when sold. Should a product fail in utility or performance, the manufacturer must repair or replace the product or make restitution to the buyer in the form of a purchase refund. The Act also limits punitive damages to no more than twice the amount of actual damages. The intent of the law was to ensure manufacturers would replace or repurchase a consumer’s vehicle as quickly as possible. However, plaintiffs’ lawyers have learned to exploit loopholes in the law and enrich themselves at the expense of a fair resolution for consumers. Two recent cases involving near identical facts clearly demonstrate the difference between bringing a Lemon Law case and a fraud case. First, a Butte County court awarded a plaintiff $126,376.56 in punitive damages (double the actual damages) for a defective car that originally cost $43,065. In a similar fraud case, a Los Angeles court awarded a plaintiff $500,000 in punitive damages when the plaintiff only suffered an actual loss of $54,364. In that case, the jury found Ford liable for concealment and intentional misrepresentation. With that big of a difference in damages, it is easy to see why plaintiffs’ attorneys prefer to bring fraud cases when the courts allow them to do so. In October 2017, a Los Angeles County judge threw out a $417 million verdict against Johnson & Johnson which attempted to tie the company’s baby powder to a woman’s development of ovarian cancer, finding no substantial evidence supported the verdict. Nevertheless, lawsuits alleging that talcum powder causes cancer continue to be filed in California. In May 2018, a Los Angeles jury found Johnson & Johnson liable for $21.7 million in compensatory damages and $4 million in punitive damages in a lawsuit claiming the company’s baby powder contained asbestos, which a jury found caused a woman to develop mesothelioma. The jury pinned two-thirds of the responsibility for her development of mesothelioma on talc and just one third to her presence while her husband did automotive work. Data privacy continues to garner national attention, as companies and regulators grapple with how to best reasonably protect consumers and their private data. True to form, California took the opportunity to impose over-burdensome regulations on businesses. This year, the legislature enacted the most radical privacy law in the country and it was signed into law by Governor Jerry Brown on June 28, 2018. The law’s most troubling provision is that its sole enforcement mechanism is a private right of action. The law provides for treble damages and attorneys’ fees, creating large incentive for the plaintiffs’ bar to file massive class actions. Consumers also can sue for data breaches without proving an actual injury, making it easy for trial lawyers to find potential class members. The California courts and legislature have long attempted to undermine the right of employers and employees to enter into arbitration agreements. Despite the U.S Supreme Court’s clear rulings finding arbitration agreements are enforceable and may not be disfavored by state laws, the California legislature again attempted to bar employers from requiring employees to sign agreements to arbitrate claims. Assembly Bill 3080 passed the state Assembly and the Senate, only to be vetoed by Governor Jerry Brown. In his veto message, Governor Brown observed that the bill “plainly violates federal law.” While this is welcome news, Governor Brown will be leaving office soon and there is no telling whether his successor, Gavin Newsom (D), will show as much measured restraint if, or when, the legislature introduces similar legislation. A stunning number of lawsuits were filed under the Americans with Disabilities Act in federal court against California businesses in 2017—2,751 lawsuits—up from 2,468 in 2016. California had the most ADA accessibility lawsuits of any state and had almost double the amount of the next closest state, Florida (1,488). These numbers do not include the many extortionate demand letters sent to businesses, nor does it include lawsuits filed in state courts. In California, penalties for ADA violations are much higher than other states due to the state’s Unruh Civil Rights Act, which allows plaintiffs to recover compensatory damages of $4,000 per violation (compared to $1,000 under federal law) plus attorneys’ fees. Often these so-called “violations” are as minor as a mirror that is an inch too high or a sidewalk or parking lot that is angled one degree too much. Not only are plaintiffs’ attorneys targeting “brick and mortar” stores, they are now targeting companies for issues with website accessibility as well. Through the first six months of 2018, 2,155 lawsuits alleging that online shopping and other website did not sufficiently accommodate individuals with visual impairments were filed in California alone. That number is more than double the next highest state, New York, which had 1,026. Even the people this law is supposed to protect are starting to speak out against these predatory lawsuits, recognizing that the litigation is having a negative impact on people with disabilities. Fortunately, some small business owners are fighting back. A San Jose law firm, the Moore Law Firm, since renamed Mission Law Firm, is being sued by the owner of Blossom True Value under the Racketeer Influenced and Corrupt Organizations (RICO) Act for making fraudulent statements in ADA access lawsuits. The firm has filed over 1,400 ADA lawsuits against small businesses across California, including one against Blossom True Value for violations that included a bathroom sign that was mounted too high. The owners had never received a complaint from a disabled customer. They fixed the problems and settled out of court for $20,000. After settlement, the hardware store owner hired a private investigator and found that the lawyers made fraudulent statements during the case – including their claim that a disabled man twice had been trapped in the bathroom. The plaintiffs’ firm has twice moved to dismiss the case, and the court has refused to do so in both instances. Trial lawyers and aggregators spend large sums on television, digital, and print advertising to recruit new clients for product liability lawsuits. California’s top media market and the second largest media market in the nation, Los Angeles, saw $7.6 million spent in its local television market to air 38,253 legal services ads in a three-month period alone between April and June of 2018. Area viewers saw 18 legal services ads every hour—that’s seven times as many ads as viewers saw for pizza delivery and restaurants. Spending on lawsuit ads in the San Francisco Bay Area totaled $1.8 million to air nearly 21,000 commercials in the second quarter of 2018.
after unanimously passing the Assembly (71-0), the Senate reused to even consider the bill. The Senate Judiciary Committee was scheduled to hear the bill in July, but the committee chair, Senator Hannah-Beth Jackson (D) took the bill off the agenda. It turns out, Consumer Attorneys of California, a group that strongly opposes the bill, is one of Jackson’s largest donors. The group has contributed almost $55,000 to her campaigns, joining a large group of lawyers and lobbyists that have donated over $650,000 to her campaigns over the years.